Councilman Cedillo hosted some hastily organized meetings the week of December 3 in order to apply for Metro’s Call For Projects grant program. Out of his four projects, only one made the cut to be submitted to Metro: a diagonal parking plan for a few blocks of North Figueroa Street. 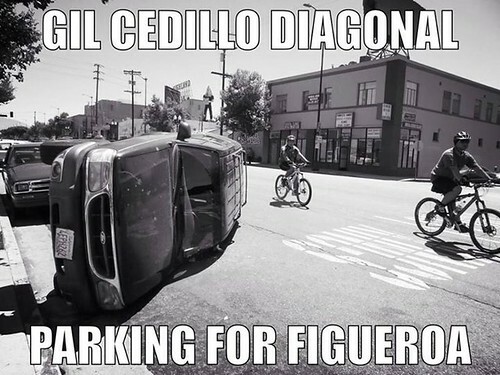 “Word from yesterday’s LA City Council session is that Cedillo turned a deaf ear to the pleas of bike riders begging for a safer street on North Figueroa, and instead went forward with a plan to install diagonal parking rather than the bike lanes called for in the city’s already approved bike plan. As anyone who has ever ridden or driven past cars attempting to back out of an angled parking space can attest, that does the exact opposite of improving safety. Standing in the same chamber where retired councilmember Bill Rosendahl famously declared that “the culture of the car is going to end now!,” Cedillo insisted that he would not be bullied by cyclists. A lot of people have been repeatedly disappointed with Councilman Cedillo’s actions regarding safe streets and bike lanes. He seems to be more concerned with public relations rather than governing. Based on the feedback we’ve gotten after the hearing yesterday, the calls for a bike- and pedestrian-friendly North Figueroa Street will only grow louder and louder as Cedillo’s first term in office drags on. This is a beautiful city and it deserves more thoughtful leadership! Let’s hope we get some in the near future.